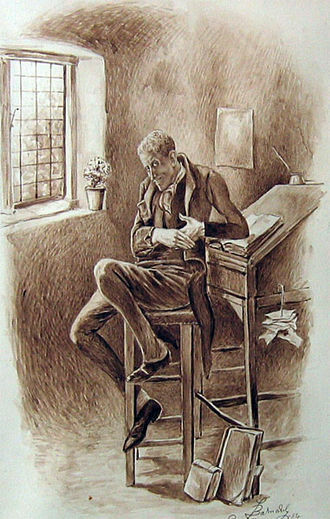 Wisdom, Humility, and Recognizing a Villain…..
Uriah Heep, from David Copperfield, is one of Charles Dickens’s most wicked characters, definitely a villain; a greedy clerk and money-lender, who fawns his way through David Copperfield and blackmails his way to success. The character has as little pigment in his body as he does decency, though he makes frequent references to his own “‘umbleness.” Heep is an evil character, a blackmailer, with no empathy for others. To read about him is to make your skin crawl! The cold, long, white hands of Uriah Heep stand in for the inhumanity of the rest of him: he is like a dead thing, totally immune to any kind of human warmth or sympathy. David is only 11 at this point, but even he is wise enough to see that Uriah Heep isn’t trustworthy. In real life, there are certainly real life villains–particular villains in each of our lives. Are we wise enough to know who they are? How do we recognize someone who would do us wrong, or put us in danger? Most of the time, they don’t look like Uriah Heep, but like everyone else we know. Well, why is that? Why does a person capable of committing evil look like the rest of us? Because he is like the rest of us–and sometimes he/she is US. So, can we recognize evil in ourselves as easily as we can in others? Can we honestly look at ourselves? Of course not; at least not easily. And that is what often makes us smug Christians, even hypocritical Christians. This is why we must open ourselves to God through prayer, asking that He allow us to see and stay away from those who would lead us astray—and most importantly, that He will allow us to see ourselves as we really are; too often the villain, too often the problem in our own lives. The wonderful thing is, He will give us the grace we need to change ourselves, if we ask for it.